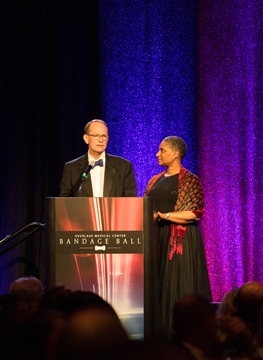 We are so sorry you were not able to join us for Bandage Ball 2018--it was truly the event of the season! Below you will find some photos and videos to give a flavor of the night. 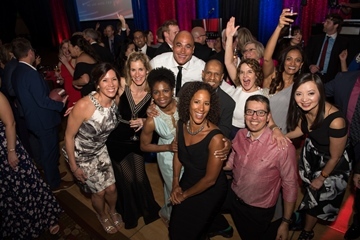 Although it WAS a rocking party, Bandage Ball 2018 had a serious and important goal: to support emergency services at Overlake. Your help is still needed--click here to make your contribution. If you live or work in Bellevue or nearby and you have a medical emergency, the ambulance will bring you to Overlake. We are your hospital. In the event of a regional disaster, such as earthquake, fire, or terrorist attack, we stand ready to respond. 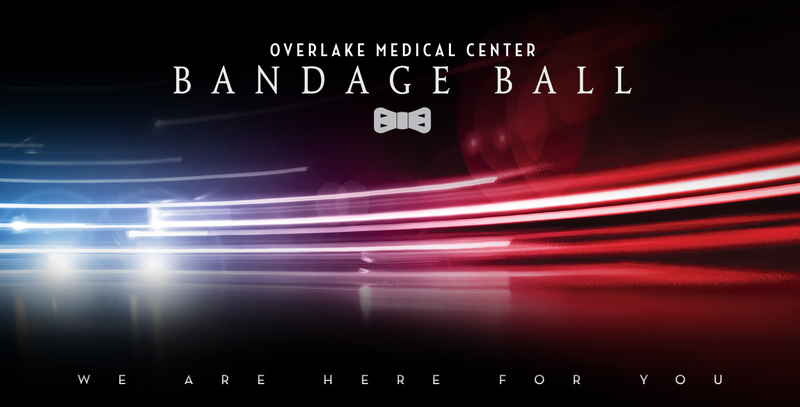 Contributions to this year's Bandage Ball--live and virtual--will support ongoing training, state-of-the-art equipment, and facilities improvements to ensure that our care remains top-tier and world-class, even in the direst of emergencies. Enjoy the photos and videos, and please click here to make your gift for emergency services for the Eastside. 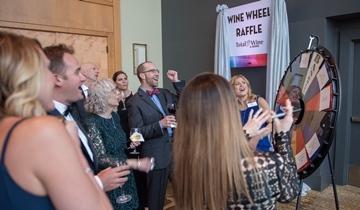 The gathering crowd clustered around the wine wheel, where a donation earned a spin of the wheel and a chance to win a premium bottle. 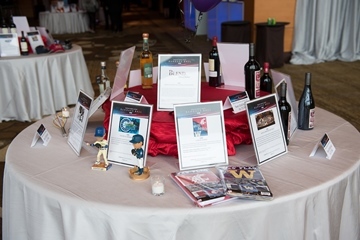 The silent auction offered a variety of treats and entertainments. Bidding was fierce. Seattle Seahawks linebacker KJ Wright joined us for a second year, signing footballs for the first 150 guests, including Hawks fan Dwayne Clark, left. 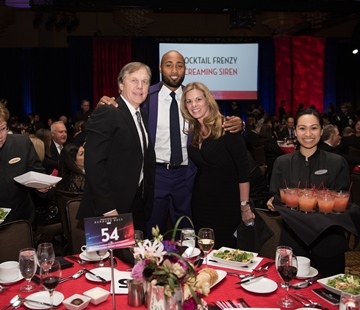 In the ballroom, winners of the Cocktail Frenzy, Dr. Steven Dawson and Tia Heimgartner-Dawson, earned a tray of Screaming Sirens and table visit from KJ. Code Blues, an Overlake physician and staff band, rocked the house. David and Jessie Woolley-Wilson told the dramatic story of David's sudden cardiac arrest and the Overlake emergency team that saved his life. 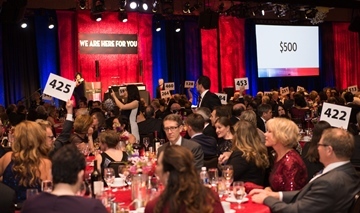 The crowd pulled out the stops in the fund-a-need portion of the evening, bringing the total raised to an incredible, record-setting $1.4 million for emergency services at Overlake. You can help push that total even higher with a gift today! Click here to make your donation. The after party was off the hook with dancing and the famous tater tot bar. Our first responder partners are grateful for the care their patients get at Overlake--and the feeling is mutual. We are also grateful to our generous community. Thank you all for your support. 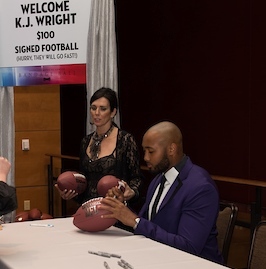 Act now and get a football signed by KJ Wright! 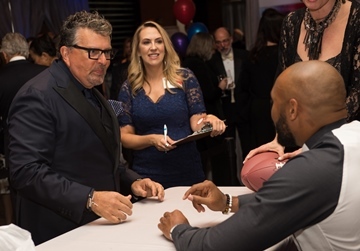 Seattle Seahawks linebacker KJ Wright graciously attended Bandage Ball and signed 150 footballs. All but seven were purchased at the event--which means one can be yours! Just click here and make a donation of $100 or more. Then send an email to foundation@overlakehospital.org and let us know you would like a football. We'll send signed footballs to the first seven people who respond. All to ensure that every patient who comes into our emergency department receives the best possible care. You are also contributing to disaster preparedness for our region. Whether there's an earthquake, a fire, and avalanche, a mass shooting, or any other regional disaster, we stand ready.